Inside Out is the first film from director Pete Docter after he wowed audiences with Up, widely considered one of Pixar’s best feature films – it is easily one of the most emotional, raising expectations for Docter’s upcoming project. Pixar often releases teaser trailers for its upcoming films a year before its release, but we have yet to see any footage from Inside Out, due out in theaters in June 2015. The studio did release a surprise today, though, in the form of a behind-the-scenes featurette, which provides us with a first look at the character Riley in whose head much of the film will take place. Take a peek at her design after the break! Released on Disney Movies Anywhere, Disney’s relatively new online service that acts as a digital locker for its films, the inside look at the film was shared as part of the Pixar Summer promotion, which is spotlighting the Emeryville-based studio’s films by offering them at a discounted price. Disney has also been testing the grounds of the service in more novel ways as well, showcasing brand new and exclusive extras that go behind-the-scenes of films. Further still, it has become a place where Disney can premiere short films, most recently seen with Pixar’s own Cars short, Radiator Springs 500 1/2. 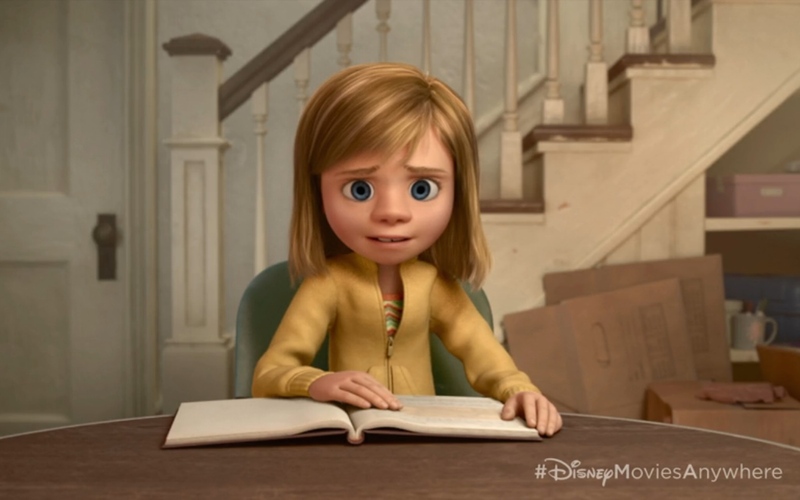 Inside Out takes place inside the mind of a young girl named Riley whose family moves cross country. Understandably, the stress from the move throws her emotions off. The film will actually center on the emotions themselves, Joy, Anger, Disgust, Fear, and Sadness, to tell much of the story. The image below was captured from the featurette on Disney Movies Anywhere. 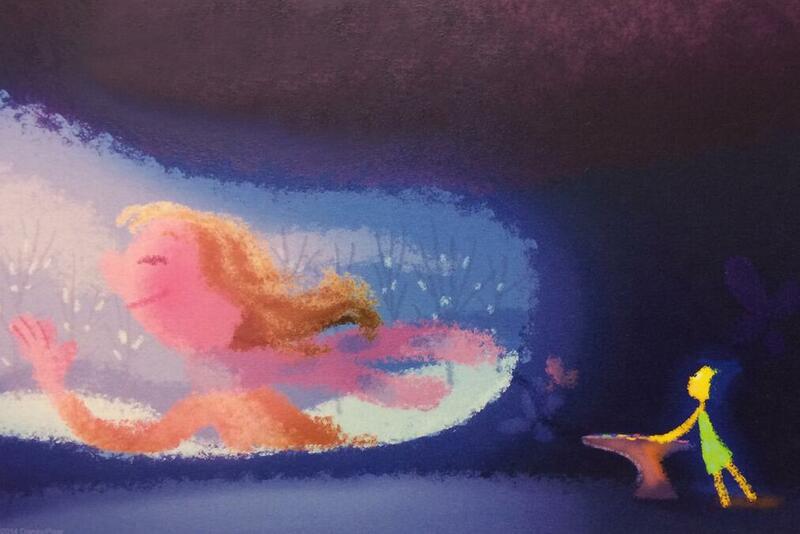 It may just be the first animation from the film released to the public. Although we won’t know if it will make it into the finished film, at the very least we are staring at what appears to be the completed design of the female character. The featurette, led by Docter and producer Jonas Rivera, also gives us peeks at the emotions – Joy (Amy Poehler), Anger (Lewis Black), Disgust (Mindy Kaling), Fear (Bill Hader), and Sadness (Phyllis Smith) – but these are designs that we have previously seen in the pieces of concept art the studio has shared. You will need an account to access the video, but it is free and a must-watch so head over to Disney Movies Anywhere to view the featurette. It is attached to the second half of a Monsters University fact video. From the tepuis of South America to a monster-filled metropolis, Academy Award®-winning director Pete Docter has taken audiences to unique and imaginative places. In 2015, he will take us to the most extraordinary location of all – inside the mind of an 11-year-old named Riley. Growing up can be a bumpy road, and it’s no exception for Riley, who is uprooted from her Midwest life when her father starts a new job in San Francisco. Like all of us, Riley is guided by her emotions – Joy (Amy Poehler), Fear (Bill Hader), Anger (Lewis Black), Disgust (Mindy Kaling) and Sadness (Phyllis Smith). The emotions live in Headquarters, the control center inside Riley’s mind, where they help advise her through everyday life. As Riley and her emotions struggle to adjust to a new life in San Francisco, turmoil ensues in Headquarters. Although Joy, Riley’s main and most important emotion, tries to keep things positive, the emotions conflict on how best to navigate a new city, house and school. The promotion for the film is just beginning. Expect to see much more in the coming months. 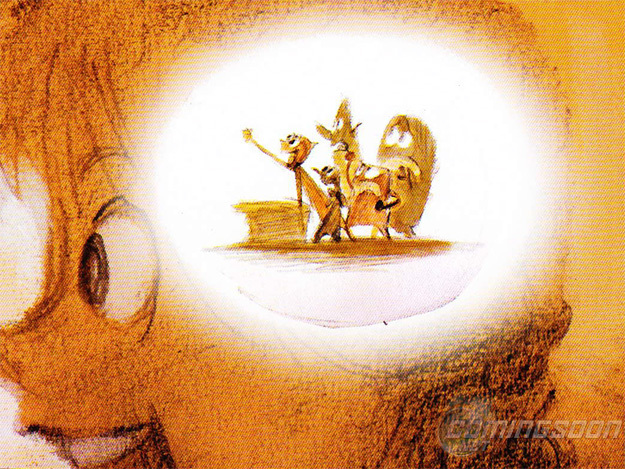 Inside Out heads to theaters on June 19, 2015!